In this article we look at the factors affecting the cost of bamboo flooring and installation prices. 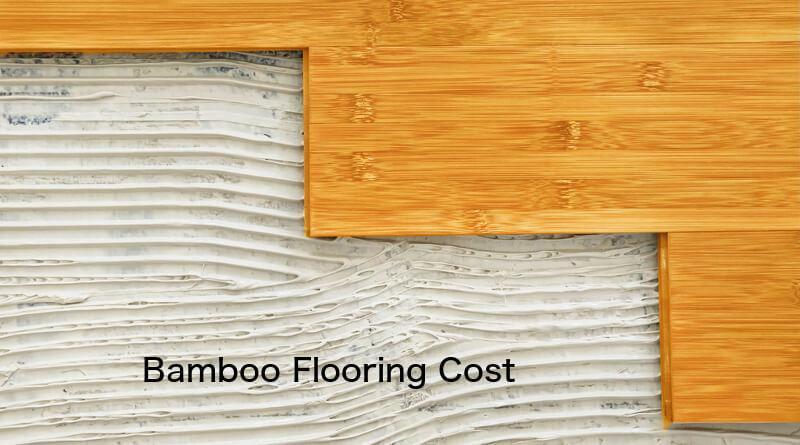 The average cost of bamboo wood flooring installed is $7.85 per square foot. There are many bamboo floor cost factors including DIY installation, so the potential cost range is less than $4.00 to more than $15 per square foot. $3.50-$6.50/sq. ft. $6.50-$9.00/sq. ft. $9.00-$15.00/sq. ft. Note: Most online bamboo hardwood flooring cost estimates are too low. This seems to be the result of overlooking premium material costs and not considering potential job extras and complexities. In this guide, we seek to cover all possible costs and give you specific cost factors. They should help you estimate your bamboo and installation costs accurately given the factors related to your project. For further guides to buying, installing and cleaning bamboo floors go to our main Bamboo and Cork Flooring page Cost factors are divided into Floor Preparation Factors, Material Factors and Installation Factors. Any type of bamboo floor can be installed on a wood subfloor. Only engineered bamboo flooring can be installed on concrete. Unless you make the happy discovery that your existing subfloor is in good condition, once having removed old flooring, you’ll probably need subfloor repair or replacement. To install plywood 4’x8’ sheets and fasteners costs about $0.75 (75 cents) per square foot. Labor for pro installation costs less than $1.00 per square foot. Total installed cost of a plywood subfloor is about $1.35 per square foot. A concrete subfloor must be covered in a moisture barrier before bamboo floors are installed. It might also need to be leveled. Pros charge $1.50 to $2.50 per square foot to level concrete using self-leveling mix. Installing the vapor barrier costs about $1.25 per square foot for materials and installation. Cost is affected by the bamboo flooring type and finish; here are the main aspects to consider. Horizontal bamboo planks are constructed of stalks sliced thinly and glued side by side. The interior off the stalks face upward to create the floor surface. This exposes the bamboo grain and the nodes called knuckles. Vertical bamboo planks use stalks sliced thin and glued so that the edges of the stalks face up to make the floor surface. This produces a more consistent, smoother appearance. Bamboo is shredded and the strands are combined with resin and pressed together in molds. The resulting block is cut into flooring planks. There’s no grain pattern as a result, but strand bamboo flooring is the hardest of all bamboo types. Mature bamboo offers better quality, is harder and is backed by a longer warranty than immature, softer bamboo. Solid and engineered bamboo hardwood flooring is available, but there is little cost difference. Laminate bamboo is a cheap type of engineered flooring with a very thin bamboo veneer. It cannot be refinished and should be avoided. To find out more, have a look at our article reviewing the the best types and brands of bamboo flooring. Unfinished bamboo floors cost $1-$2.50 less than finished flooring, depending on other cost factors. Unfinished flooring requires sanding, staining if desired, and then sealing with several coats of protective polyurethane or similar. It’s a good way for DIY cost savings. However, buying finished flooring costs less than buying unfinished bamboo and hiring a pro to finish it. Carbonizing the bamboo is achieved by boiling it until the sugars in it caramelize, turning the material a rich brown. This increases cost by about $1 per square foot. Tiger striped flooring is produced by alternating strips of carbonized and natural bamboo. This flooring is usually in the Average to High cost range. Hand scraped and hand sculpted flooring for an aged or antique look are the most expensive finishing processes. Direct printing the bamboo is the process of printing a different grain pattern, such as oak, onto the flooring. It gives it the look of hardwood while maintaining the benefits of bamboo. This increases cost by less than $1 per square foot. Flooring installers produce estimates starting with a base price of approximately $3.00 to $4.00 per square foot. The price for each installer is based on their reputation, local competition and the cost of living. If the job is simple, then the installation estimate will fall in that range. Cost rises to as high as $8.00 per square foot for very difficult work. Stairs are priced separately, as you’ll see below. Removing old flooring: Removing and disposing of old material costs $0.40 to $0.75 (40 to 75 cents) per square foot. Installation type: Floating floors that are fastened only at the perimeter install quickly and at the lowest cost. Nailed floors cost a bit more. Those that are glued down take the longest to install, so cost is highest. Flooring quantity: Small jobs that take less than a full day cost more per square foot, because the installer must cover travel time and the time required to set up and take out equipment. Room sizes: Small rooms require more time-consuming trimming per square feet of flooring, so cost per square foot goes up. Obstacles: The amount of trimming and piecing go up when there are obstacles to work around such as cabinets, fireplace tiles or a hearth, bath fixtures and similar. Clearing rooms: Installers might charge extra if they are asked to empty rooms of furniture and appliances prior to installation. $20-$50 per room is typical depending on the number and weight of items to be moved. Cost of living: It’s not unusual for prices to be 30 to 50 percent higher in large metropolitan areas, especially in the Northeast and along the Coasts than in small towns and rural areas. Want to know whether Bamboo is the right flooring for you? Check out our Bamboo Vs Cork Flooring Guide. Installation on stairs goes slowly due to the amount of trimming required. Whether just the treads or the risers too are covered affects cost. Cost is highest when trimming and piecing around stair spindles is required. Expect estimates of $40-$75 per stair – or $650 to $900 for a full set of stairs. The best way to get a fair price for quality installation is to get written estimates from several bamboo flooring contractors. Let them know you’re getting competing estimates, and they’ll give you their best bid. Before hiring a floor company, make sure its installation crew has experience and a reputation for good workmanship. That’s worth paying for – and there will be less chance you’ll have to pay someone else to “do it right” at a later time.